The C200 20-inch Strap Chaise Lounge is the tallest of our high chaise lounge chairs. The C200 is the perfect chaise lounge for seniors, the elderly, and retirement communities. It is constructed from only high quality materials, including commercial-grade extruded aluminum, TGIC powder-coating, and 2" wide double-wrapped vinyl straps. 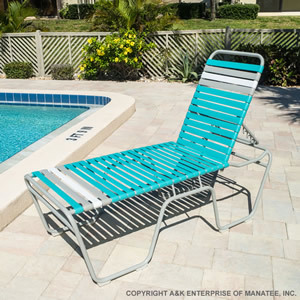 This 20-inch high chaise lounge stacks for easy storage during the winter months and is completely customizable from the frame color to the strapping pattern. Perfect for any pool or patio! Request a quote for the C200 today!